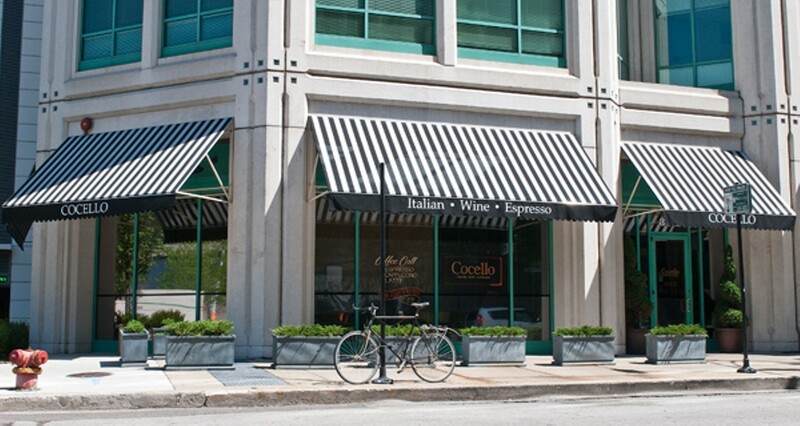 The former Dillman's has undergone an overnight transformation into Cocello. Imagine a looming dystopian future in which Italian restaurants have replaced all the city's faux Irish bars, and the only things left to go out for are risotto and little scraps of raw fish. That's where we're headed. But truthfully—excepting the 800-pound gorilla on Ohio Street—2014's most unoriginal restaurant concept has had a pretty good track record so far, as witnessed by the Reader's own reviews of Joe Fish, Nico Osteria, Cicchetti , and Azzurra EnoTavola. I'd inquired of Brendan Sodikoff what "cocello" meant, imagining there might be some folksy Italian colloquialism that inspired Hogsalt Hospitality's own entrant in the restaurant scene's Italian Saturation Project. "It's the name of an Italian restaurant in Chicago," he replied. "We just wanted it to be its own thing." That thing is housed in the barely redesigned space that was once home to Dillman's, Sodikoff's ill-fated (and lamented at least by this writer) Jewish deli—a modern and upscale interpretation that was truly its own thing. If you're going by looks, Cocello—after what was perhaps the fastest restaurant turnaround ever—isn't much of its own thing, still hung with the deli's chandeliers, the same dark, clubby vibe enhanced by overstuffed chairs and tables set behind a central bar. Menuwise, the mercurial Sodikoff made a shift from a proposed Italian steak house to a menu firmly focused on handmade pastas, orbited by smaller groups of salads, antipasti, meat and fish entrees, and the now-requisite offerings of crudo. Regarding the last, I have by this point developed a reflexive bias against these insubstantial raw plates that every new restaurant feels obligated to introduce their menus with. They rarely seem to satisfy given their price points. At least Cocello's simple red snapper crudo with lemon, olive oil, and a dusting of chile features the crystalline crunch of sea salt for textural interest, but its beef carpaccio is an anemic-looking sheet of pink meat that practically disintegrates at the touch. There are more inspiring ways to approach Cocello among the simple salads, such as a dish of peas and favas with whipped ricotta that is the embodiment of spring, or among the antipasti, such as a bouquet of fried artichoke hearts, simply seasoned with Parmesan and chile, lemon providing the fundamental foil for the crispy and salty vegetable. Among the vegetable side dishes there's a "Friulan frico," a kind of panfried cheesy latke that could teach poutine how to be edible. But whatever you do, do not fail to order the roasted octopus, served with giant capers and a spicy Calabrian spread called neonata, made from tiny preserved fish. The tentacles are charred in such a way that the beast's skin crisps and separates like chicken skin as it bathes in the umami-concentrated sauce—one of my favorites dishes of the year so far. Standards such as grilled fish and Tuscan-style steak are among the larger plates, as is an occasionally available and oddly bland osso buco that cries out for an accompanying starch. But a chicken cacciatore—without any tomato to make it register as anything like cacciatore—is a surprise, the juicy bird wallowing in a sauce of its own reduced juices brightened by lemon and fennel and soaking into smashed fingerling potatoes. So too a thick slab of porchetta perfumed by rosemary is an irresistible contrast of meaty pork loin and gloriously fatty belly. But the things that are going to make Cocello stand out among its fellow Italians are its pastas, eight handmade varieties served in appropriately moderate portions, as simple and lovely as cacio de pepe, a mound of thin, flat tentacular strands covered in shards of Reggiano, and linguine and clams, its broth punched up with vermouth and chile. 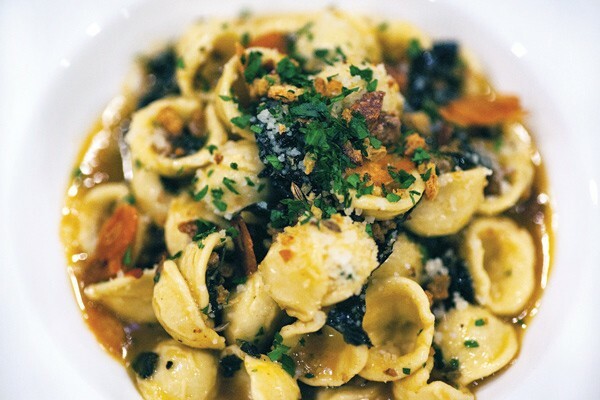 Meanwhile bowls of orecchiette tossed with fennel sausage, chewy kale, and slivers of toasted garlic or hand-rolled penne in bright, acidic, guanciale-loaded Amatriciana sauce taste as bold and vibrant as the others are mild and comforting. But it's the noodles themselves that make these plates. It's not surprising that these pastas are so good when historically Hogsalt restaurants have done so well with flour, water, and egg. Just as at Bavette's and Dillman's, the table bread at Cocello is wonderful. A fennel-sesame sourdough with hearty brown crust and pillowy crumb, it raises a nagging question: Why doesn't Sodikoff open a bakery? It comes up again at dessert, where among the affogato, tiramisu, and zeppole there's a tall slice of warm olive-oil cake, jiggly and moist and mined with orange zest, that beats all with its beautiful simplicity. Most of Sodikoff's restaurants nail classic cocktails too. Here the negroni gets top billing, smooth, bitter, and boozy in four variations. But others, like a manhattan deepened by Luxardo Amaro Abano or a vermouth julep in an icy silver cup, are worth a try as well. At the moment Cocello's biggest liability may be its servers, who seem disorganized or downright somnambulant. Maybe it isn't that exciting to work in the umpteenth new Italian restaurant in town. Maybe to them it feels like a cynical move. But at least in terms of its food Cocello is indeed its own thing. An Italian-trained Scottish chef specializes in the rich food of Italy's northwestern region. Long-haul truckers from across the country know to pull off on Exit 9 in Gary for a taste of home.